"If our peculiarity went to the extent that we lived by every word that proceeds from the mouth of our Heavenly Father [see D&C 84:44], then we would indeed be a blessed people." I noticed D&C 84:44 is referenced in connection with the statement. So I asked myself, Where do I find "every word" that proceeds from the mouth of our Heavenly Father? And I found an answer in the words of the Old Testament Prophet Jeremiah. I found a similar answer in God's words given through the Prophet Joseph Smith. Both of these verses refer to "my servants." But who are these "servants?" Who are these "prophets?" I find answers to these questions in the Lord's preface to the Doctrine and Covenants. In our day, we sustain Thomas S. Monson as "prophet, seer, and revelator and President of The Church of Jesus Christ of Latter-day Saints." 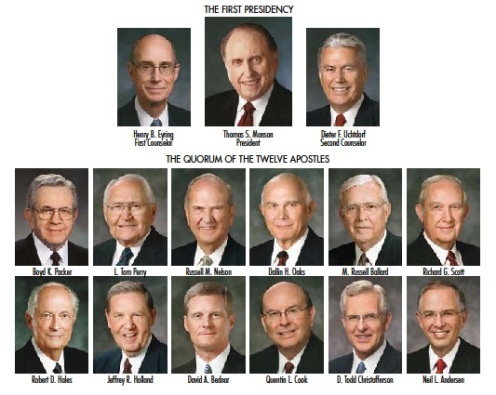 We also sustain his counselors in the First Presidency and the Twelve Apostles as "prophets, seers, and revelators." God calls prophets to represent Him on earth. God's prophets teach His truth and help us understand the words of earlier prophets. When prophets speak for God, it is as if God himself were speaking. In that sense, they become God's mouth to us. New revelation for the whole Church comes only through the Church President. He is "the prophet." However, he is not the only prophet on earth today. His two counselors are prophets. And the Twelve Apostles also have the calling of prophet. Just as a historical footnote: no president from Brigham Young up until David O. McKay was addressed as "prophet," even though we sustain them as such. If anyone had used the words "the prophet" in BY's day, it would have been understood by all that that person was referring to Joseph Smith, the prophet of the latter days. Brigham was referred to as President Young, Br. Brigham, even Brigham, but never as "the prophet." "The Lord, through His servant, the Prophet Wilford Woodruff, told you Latter-day Saints, at the time that great Temple was being dedicated, that the bitterness would be taken out of the hearts of our enemies, and their hearts would be softened towards us.